T-Mobile announced a huge new “unlimited and unlocked iPhone” initiative today that will launch Sept. 12—a date that should ring a bell. The nation’s fourth-largest carrier does not and will not officially carry the iPhone, but its parent company carries the iPhone all over Europe and was even the original carrier in its home Germany. The biggest issue with T-Mobile USA and the iPhone is that T-Mobile’s 3G/4G bands are incompatible with Apple’s iPhone hardware. Therefore, a million plus iPhone users are kept to EDGE 2.5G speeds, which seemed to work O.K. for the original iPhone, but five years have passed since it first launched and expectations have largely risen. Today’s announcement is a big one for T-Mobile and will be accompanied by a large marketing push. T-Mobile claims —and the math seems to work— that it will save users $50 a month over similar AT&T plans. The total savings amount equals $1,200 over the life of a two-year contract. T-Mobile will have a store-within-a-store for iPhone users who want to make the hop. Trained T-Mobile salespeople will be able to instruct users on unlocking, but they will not physically open the devices. This is an unprecedented move…especially for a device that T-Mobile does not officially carry. Getting your hands on an unlocked device is pretty easy and will probably get a lot easier over the next weeks as the new iPhone is announced. Apple has offered the iPhone 4 and iPhone 4S unlocked almost since it released last year and you can currently snap up a new one at eBay for about $580. T-Mobile has some more good news for prospective iPhone customers today: Remember the iPhone-compatible 1900MHz network it demo’ed at WWDC? That same 1900MHz 4G network is rolling out in Seattle, Las Vegas, Washington, DC, and the New York metro area currently (readers? sightings?). Even better: T-Mobile’s tests of unlocked iPhone 4S devices running over 4G (HSPA+) on its 1900 band have recorded 70 percent faster average download speeds than iPhone 4S on AT&T’s network. We will wait for neutral parties to review before judging and, obviously, LTE is coming for the iPhone 5, which T-Mobile expects will run on its network. However, the best part might be the company behind the network. T-Mobile allows its customers to make and receive calls over Wi-Fi when there is no network on their smartphones. The iPhone is no exception. T-Mobile has the Bobsled app for iPhone for making calls. This is fantastic not only when in low -service areas but also when travelling abroad. T-Mobile will release other apps soon for things like live TV, account management and visual voicemail. We’re also developing iOS versions of helpful T-Mobile applications like T-Mobile myAccount, T-MobileVisual Voicemail and T-Mobile TV (we already offer an iOS version of our popular Bobsled application). Check out AT&T’s Customer Device Unlock page for more information. T-Mobile has been a champion of “bring your own device” wireless with our affordable Value plans that separate the cost of wireless service from the purchase of a new phone. This means there are a lot of devices running on our network that we don’t sell in our stores, including more than 1M iPhones. 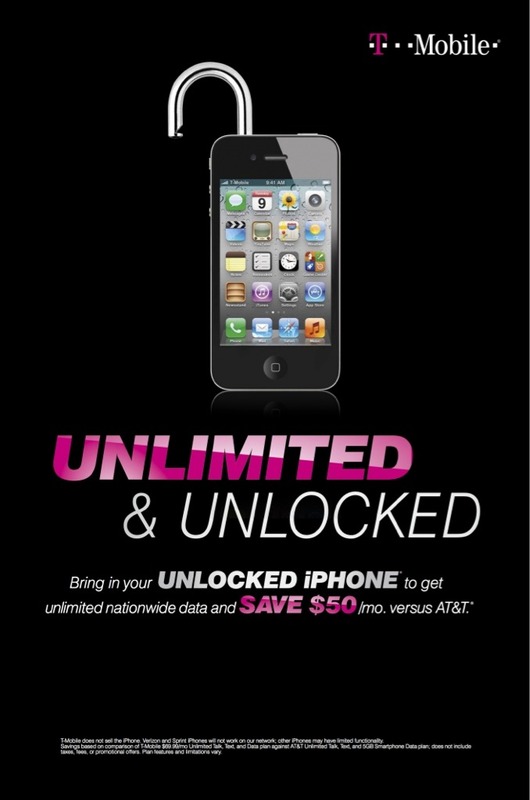 We see a big opportunity to make the experience of bringing an unlocked iPhone to T-Mobile even better for customers. · Unlimited data: T-Mobile offers worry-free, unlimited nationwide data. · Cost Savings: Customers with unlocked iPhones can save $50/month compared to AT&T*. · Nationwide coverage that’s only getting better: T-Mobile’s voice network reaches 96% of all Americans, and later this year, as we transform our network, introducing 4G (HSPA+) service in our iPhone-compatible spectrum, these unlocked iPhones will get a significant speed boost where these improvements are available. As new equipment is in place, we’re already starting to turn up 4G HSPA+ service in our 1900 MHz spectrum. With sites live in cities like Seattle, Las Vegas, Washington, DC and the New York metro area, don’t be surprised to hear reports of iPhone speed sightings. In fact, our internal tests of unlocked iPhone 4S devices running over 4G (HSPA+) on our 1900 band recorded 70% faster average download speeds than iPhone 4S on AT&T’s network. We expect to have these improvements broadly deployed in a large number of markets later this year.